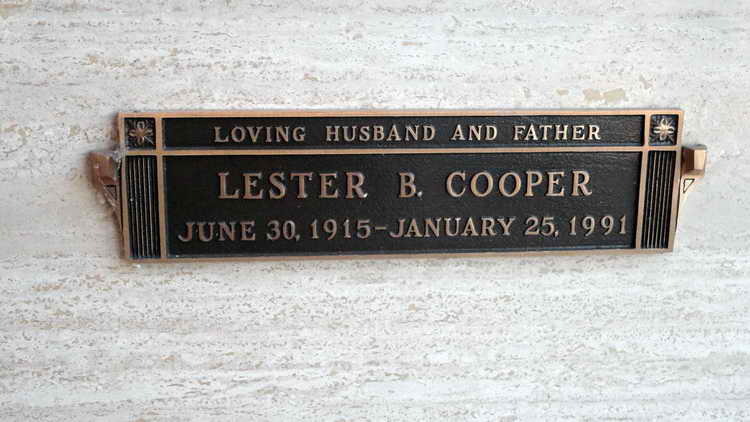 Crypt marker for Lester B. Cooper the Golden Corridor of Santa Rosa Memorial Park, Santa Rosa (Sonoma), CA. Lester enlisted in the Army at the Presidio of Monterey, CA on 6 February 1942. Sgt Cooper was transferred from the 507th PIR to the Hq Hq 508th as a cadre member on 16 October 1942. On 5 November he was promoted to First Sergeant (temporary). 1st Sgt Cooper was seriously wounded in action in Normandy on 6 June 1944 and was evacuated to the 76th General Hospital. On 23 June 1944 he was placed on Detached Service with the Detachment of Patients at the 4177th US Army Hospital in Moreton-on-Lugg, Herefordshire, England. On 20 September 1944 1st Sgt Cooper was released from hospital and assigned to the 10th Replacement Dept in Lichfield. Eight days later he was transferred back to the 508th.